An ideal partner for machining large diameter components used in heavy engineering industry such as automobile, oil & natural gas, earth moving, various allied and subcontracting industries. 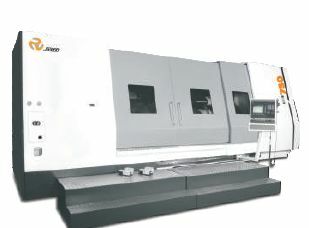 Offer wide range of cutting sizes along with rapid positioning & bidirectional turret, for unmatched cycle time. Turn-mill Option with Driven Tool Turret : Servo driven 12 Station -Live Tool Turret can be chosen for Turn-Mill Center version which allows mix and match of static or powered tools. Turret movement is controlled by High- Torque motor for various applications like PCD Drilling & Tapping, OD & ID profiles with Radial and Axial Live Tools.